CANCUN, Mexico, December 11, 2010 (ENS) – The United Nations climate change conference in Cancun wrapped up two weeks of negotiations at dawn this morning with agreement on a package of decisions that UN officials are hailing as a victory. The Cancun Agreements recognize the goal of reducing greenhouse gas emissions from rich countries by 25 to 40 percent from 1990 levels within the next 10 years. Current pledges amount to about 16 percent; the United States has pledged a 17 percent reduction by 2020. Delegates from 194 countries agreed to seek “deep cuts” in greenhouse gas emissions, but they put off the essential question of how much all nations will cut emissions to next year’s talks in Durban, South Africa. They agreed that there should be no gap between the first and second commitment periods of the Kyoto Protocol, an addition to the UN Framework Convention on Climate Change UNFCCC, that contains legally binding measures to reduce greenhouse gas emissions for 37 developed countries. The protocol’s first commitment period will expire at the end of 2012. Japan and Russia, now bound by the protocol, announced in Cancun that they would not enter a second commitment period. Delegates agreed that carbon dioxide capture and storage in geological formations will be included as an eligible project activity under the Kyoto Protocol’s Clean Development Mechanism. This flexible mechanism allows the 37 countries to fulfill their greenhouse gas emission obligations by investing in projects that reduce emissions in developing countries. Delegates also agreed to establish a Green Climate Fund of US$30 billion of new contributions for the period 2010-?2012 to help the most vulnerable developing countries adapt to the unavoidable impacts of climate change and reduce their carbon footprints. In the longer term, developed countries committed to a goal of mobilizing jointly US$100 billion per year by 2020 to address the needs of poorer countries. A “significant share” of new multilateral funding for adaptation should flow through the Green Climate Fund, which will be managed by the World Bank for the first three years, delegates agreed. The Cancun Agreements include action to protect the world’s forests, important because deforestation accounts for nearly one-fifth of all global carbon dioxide emissions. Delegates decided to establish a three-phase process for tropical countries to reduce deforestation and receive compensation from developed countries in an agreement that includes protections for forest peoples and biodiversity. They also created a mechanism to share clean technologies to help developing countries move away from fossil fuels. After last year’s contentious negotiations in Copenhagen, delegates in Cancun showed a more cooperative spirit, greeting the outcome with a standing ovation for conference president Mexico’s Foreign Minister Patricia Espinosa. 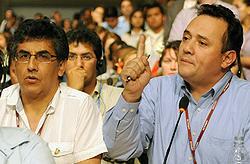 Espinosa brought delegates to agreement without the approval of Bolivia, which objected that the Cancun Agreements amount to a blank check for developed nations because the documents specifying their commitments have not yet been published. “The texts on the table represent the work of many delegations that carry the hope of delivering what our societies expect. I take note of your opinion, but if there are no other objections, this text is approved,” Espinosa told Bolivian delegate Pablo Solon. “Consensus does not mean that one nation can choose to apply a veto on a process that other nations have been working on for years. 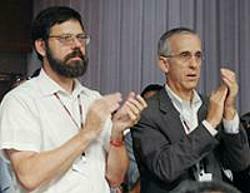 I cannot ignore the opinion of another 193 states that are parties,” Espinosa said. 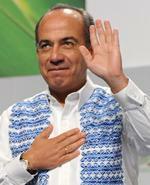 Mexico’s President Felipe Calderon praised the delegates for reaching agreement to fight global warming. Today, President Barack Obama telephoned President Calderon to congratulate him on the conference’s outcome. “Obama congratulated President Calderon for his leadership and Mexico’s excellent work chairing the Cancun conference to a successful conclusion that … advances the effort to address the challenge of climate change,” the White House said in a statement. Most observers called the Cancun Agreements a modest achievement that puts climate negotiations back on track after the disappointing talks in Copenhagen. But others blamed the balance of power in the U.S. Congress for hampering the world’s ability to deal with damaging climate change.